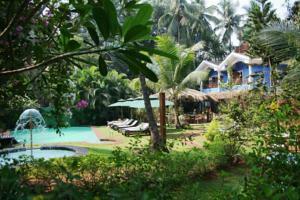 Presa di Goa offers 4-star colonial-style rooms and pool in a restored country house. Wi-Fi in public areas, parking and shuttle service are all free of charge. Situated in tropical landscapes, air-conditioned rooms feature antique wood furnishings, woven carpets and craftwork. They are fitted with satellite TV and a safe. Private bathrooms have a hairdryer and hot/cold shower. To relax, guests can play card and board games in the games room or enjoy refreshing massages. Quiet moments can be enjoyed in Presa di Goa’s tropical gardens and library. Views of tropical greenery accompany Mediterranean and local dishes at the garden restaurant. Grilled dishes are also available. Meals can be served in rooms. Hotel Presa di Goa is a 5-minute drive from historic Saligao Church. It is 28 km from Thivim Railway Station and 45 km from Dabolim Airport. Free! All children under 2 years stay free of charge when using existing beds. Free! One child under 2 years stays free of charge in a child's cot/crib. One older child or adult is charged INR 1500 per night and person in an extra bed. Maximum capacity of extra beds/children's cots in a room is 1. Any type of extra bed or child's cot/crib is upon request and needs to be confirmed by the hotel. Supplements will not be calculated automatically in the total costs and have to be paid separately in the hotel.